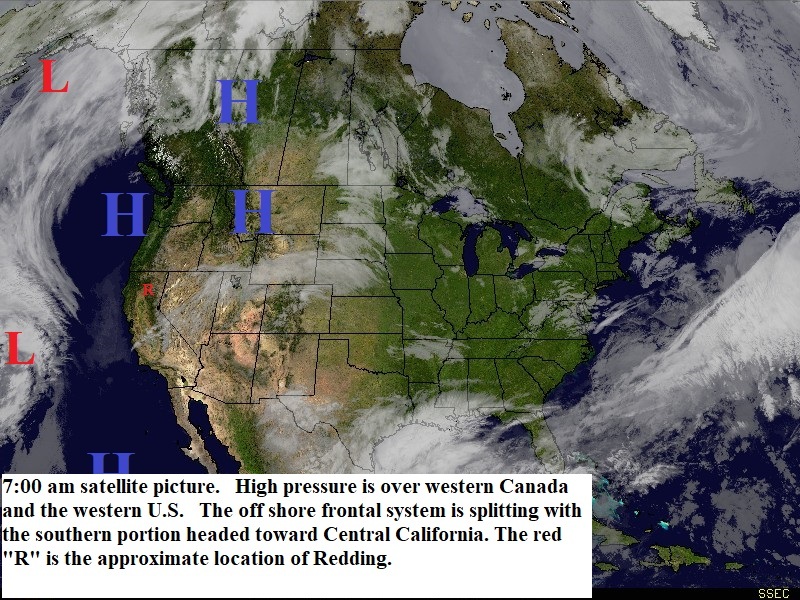 A high pressure ridge continues over western Canada and the Northwestern U.S. This if forcing the frontal system that is approaching the coast to split. The south half of the system will move across Central California late Tuesday and Wednesday.. Today will be sunny with slightly above )normal temperatures. Clouds increase Tuesday with scattered light showers late Tuesday and Wednesday. Snow levels will be 5500 to 6500 feet. Thursday looks partly to mostly sunny and then Friday and early Saturday another low pressure trough will move through (see map below). This system will take a more northern track and should bring light rain to Northern California Friday and early Saturday. Snow levels will remain 5000 to 6000 feet. There will be a break Saturday afternoon through early Monday and then another low pressure trough will bring rain to the northstate.